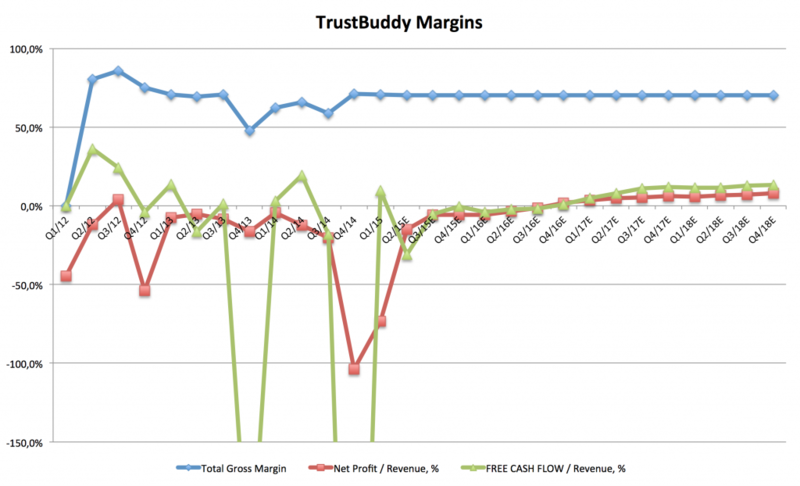 TrustBuddy announced a fully underwritten preferential rights share issue on August 18th, 2015 which was approved on their extraordinary general meeting in September 18th, 2015. This post will investigate if it is a good idea to participate in this share issue, both from a current and non-current shareholder’s perspective. According to the announcement, the reasons for the share issue are; (1) to finance the acquisition of Geldvoorelkaar, (2) repay a short-term loan, and (3) ”ensure the company’s capital requirements until a cost reduction program is fully implemented.” In order to realize this, TrustBuddy wants to (1) issue a maximum of roughly 405 million shares through a preferential rights issue with a subscription price of 0,15 SEK per share, diluting current investors by 50%. This could raise the company around 61 MSEK before issue costs. (2) If 33% of the new shares generate a call option where all later are exercised in October 2016 at the price of 0,18 SEK, that adds another 135 million shares and 24 MSEK in cash, diluting your initial position with another 33%. (3) Given that the non-preferential rights issue towards institutional investors of 200 million shares plays through, it dilutes your initial position with another 49% whereas the subscription price will be decided later, with a discount to the current market price. This could possibly raise an amount between 8 and 16 MSEK given what we know today. (4) An incentive program for selected senior executives adds 90,2 million options where each option entitles its holder to subscribe for one new share. The exercise price will be set at 175% of the average share price from October 2015 and can be exercised in November 2018. (5) An incentive program for board members adds 24,4 million options where each options entitles its holder to subscribe for one new share with the same terms as in (4). All together, these events adds up to; Initial 405 million shares, preferential rights issue 405 million shares, call options 135 million shares, the non-preferential 200 million shares, the incentive program for senior executives of 90,2 million shares if exercised, and the incentive program for board members of 24,4 million shares if exercised. In total 1,26 billion shares. In other words, your initial position is diluted by 63%. This means your initial ownership of the company of for instance 1%, will become 0,37% of the company given full subscription of the share issues. The big question is now, should I participate in the share issue as a current owner? Also, should I as a non-current owner, buy the share at current levels before the deadline of October 7th, which is the last day to buy the share in order to participate in the preferential rights issue and receive the options? 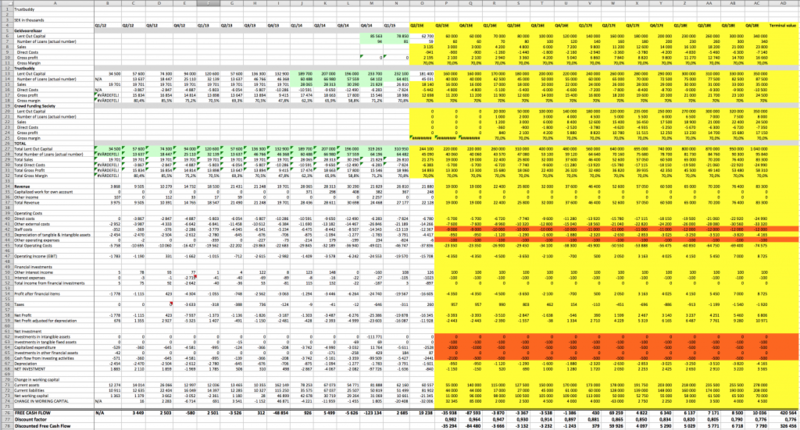 First, let us revise recent significant events to account for in our updated DCF analysis. On August 17th, 2015, the company announced the new CEO, Philip Mikal, with a recent background from the successful Swedish payment company Klarna. According to his LinkedIn-profile, he has been the Founder/Co-Founder of at least three start-ups. During the last seven years he has been involved in payment related companies whereof three years at Klarna. On September 9th, 2015, the company announced three new key recruits where all are from Klarna; Kevin Albrecht as new Chief Technology Officer (CTO), Chad Mazzola as new Chief Product Officer (CPO), and John Ward as new Chief Operating Officer (COO). CEO Philip Mikal says, ”I worked closely with Kevin, Chad, and John during my time at Klarna, and there is no other team I’d rather bring to TrustBuddy.”. On September 21st, 2015, the company announced that all motions were approved by the shareholders at the Extra General Meeting which took place on September 18th, 2015. The DCF from our analysis back in August 14th, 2015 is now updated with 15Q2 figures. First, the numbers for the amount of loans in Q1 and Q2 from each quarter report, does not add up according to their six month figure on the Q2 report. This raises an eyebrow. 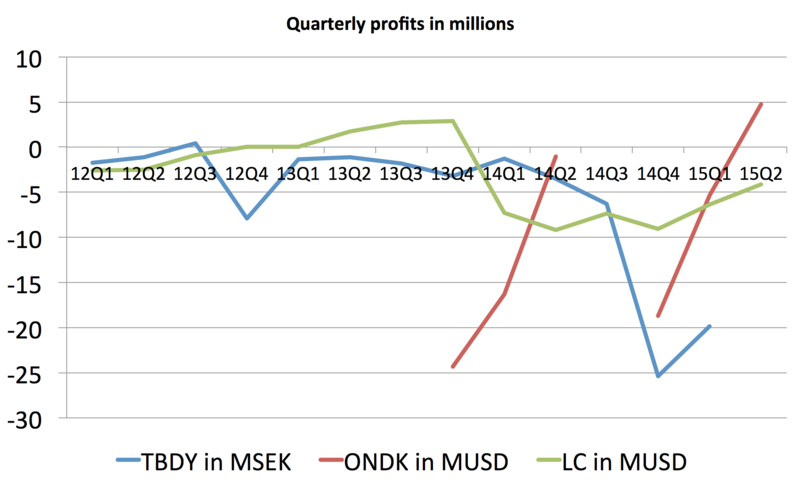 Second, their free cash flow show a positive figure of 19 MSEK whereas their net profit amounts to -16 MSEK. This is due to approximately 17 MSEK long-term debt has now become short-term debt, which affects the company’s working capital in a positive manner. Although, as their working capital has become negative, they will not survive if it weren’t for this share issue. Supposedly, this debt is the ”short-term financing arrangement” for the EUR 3 million cash for Geldvoorelkaar, as is recognized in the pressrelease from November 13th, 2014 and August 17th, 2015. "Subject to the satisfaction of certain conditions, TrustBuddy has agreed to acquire Geldvoorelkaar for a consideration of EUR10.6m. The consideration comprises EUR 3 million cash, EUR 4 million through the issue of new shares at a 20% premium to the pre-announcement share price and a EUR 3.6 million vendor loan of which 50% is redeemed in January 2016 and 50% redeemed in January 2017. Shares issued as part of the consideration will be subject to lock-up restrictions which expire in January 2016 in respect of 50% of the shares and January 2017 for the remainder." The new shares to be used as payment were issued around December 16th, 2014. The EUR 3 million in cash was supposedly accounted for in Q4 2014 as the Q4 report states how 34,2 MSEK was raised due to the acquisition of Geldvoorelkaar. The first 50% of the EUR 3,6 million is due in January 2016, and is covered by this share issue. Finally, recent announcements which provide us with some guidance. 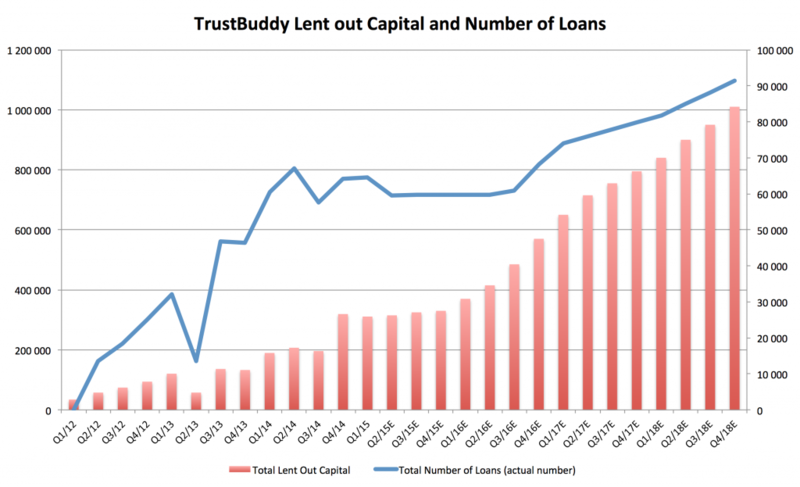 In the announcement from September 14th, 2015, the CEO Philip Mikal indicates TrustBuddy will keep both its short-term lending and its upcoming long-term lending. This contradicts a previously announced strategy back in May 7th, 2015, where they indicated they will phase out short-term lending in favor of long-term lending. Also, the September-announcement indicates how the focus will turn to internal rationalization, fine-tuning current products and processes. This is the DCF scenario which is generated given our interpretation of the aforementioned news and announcements. This renders a fair value per share of 0,59 SEK before the share issue, i.e. before October 8th. On October 8th and forward, the value should be 0,22 SEK. On October 1st the share closed at 0,252 SEK. On October 8th, the share price will drop 65% from its closing price from October 7th, due to the dilution, to approximately 0,09 SEK given the above. Let me lay up five different scenarios for you and then you can decide for yourself for which strategy that will suit you best. 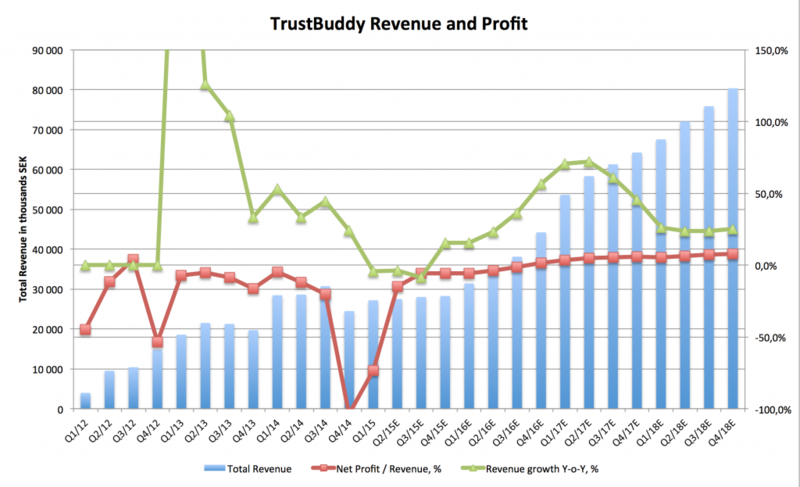 You believe the share will perform poorly the next 12 months and thus you stay away from the TrustBuddy share. You buy shares for 4 000 SEK, the same amount as was spent in scenario 1, on October 8th for 0,09 SEK per share which gives you 44 444 shares and no options. 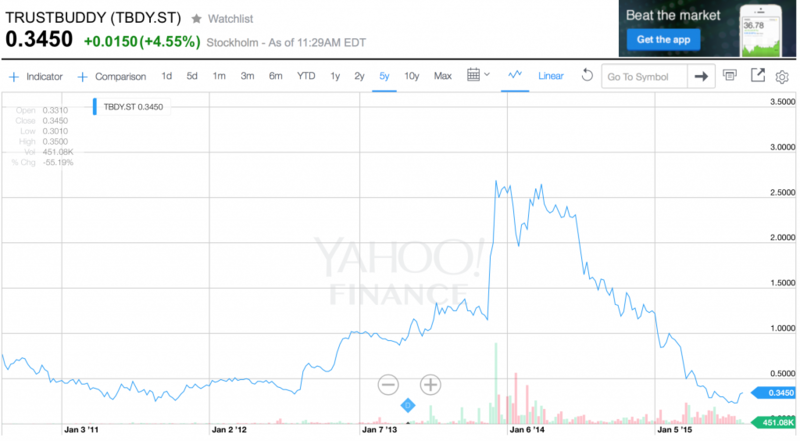 One year later the share price is 0,22 and you sell all and receive 9 778 SEK, a gain of 5 778 SEK or 144%. You buy 10 000 shares at 0,25 SEK before October 8th for 2 500 SEK. On October 8th, the price drops to 0,09 SEK per share. Soon, you subscribe for another 10 000 shares and for 0,15 SEK per share and pay another 1 500 SEK. 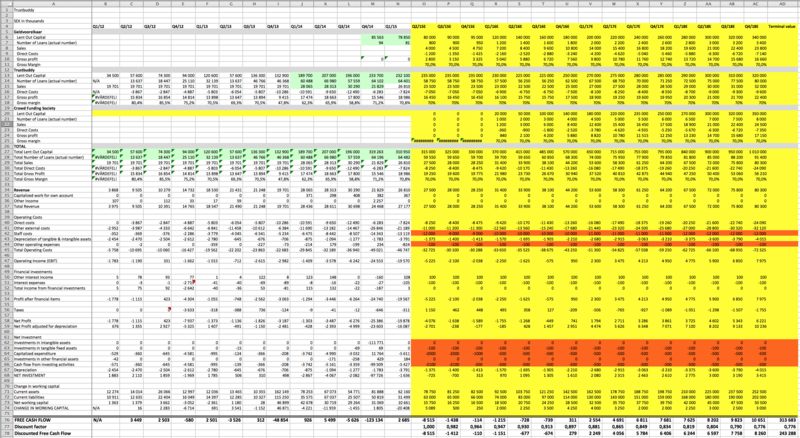 You have now spent 4000 SEK for 20 000 shares and 3 333 options. 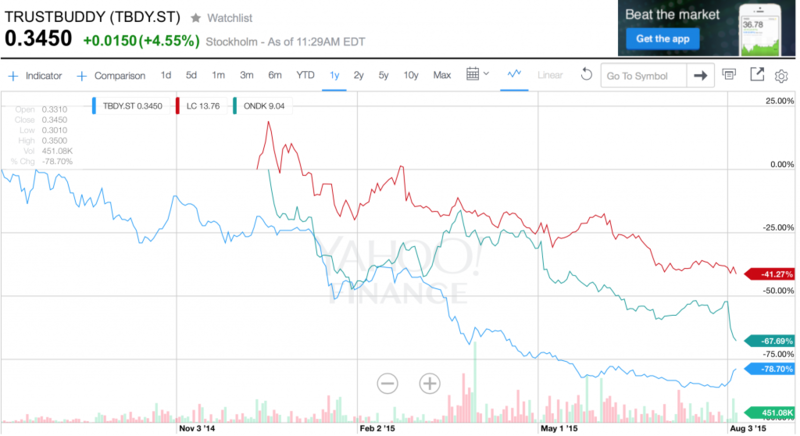 One year later, the share price is 1,00 SEK, and you sell all. 20 000 shares times 1,00 SEK is 20 000 SEK plus 3 333 options for 0,82 SEK each is 2 733 SEK, sums up to 22 733 SEK, a gain of 18 733 SEK or 468%. You buy shares for 4 000 SEK, the same amount as was spent in scenario 1, on October 8th for 0,09 SEK per share which gives you 44 444 shares and no options. One year later the share price is 1,00 and you sell all and receive 44 444 SEK, a gain of 40 444 SEK or 1011%. In the pressrelease from September 21st, 2015, Chairman Simon Nathanson says ”the Board of Directors will subscribe to a maximum of 18,000,000 of the 24,400,000 warrants directed to the current Board of Directors as part of the approved incentive program for board members.” This means, they will buy these warrants (options), after the great dilution has taken place. These 18 million warrants could cost them as little as 300 000 SEK divided by four board members, i.e. 75 000 SEK each, and then another 15 000 SEK each if they exercise them all three years later and the exercise price turns out to be 0,2 SEK per share, as the exercise price will be 175% of the average share price during October 2015. That is a really good deal, for them. This is not an incredibly strong signal as the 18 million number first might appear as they will not be spending ”that much” of their own cash. But, it is always something. Currently, the Chairman of the Board Simon Nathanson owns a symbolic amount of 75 000 shares and board member Torsten Örtengren holds a symbolic amount of 50 000 shares, whereas board members Tove Mette Dramstad and Søren Brinkmann both hold zero shares. The new recruits from Klarna still hold zero shares. On top of this, the share price is expected to drop below the share issue subscription price of 0,15 SEK. Although, you would receive an option for each three subscribed new shares. This option could be trading in the range of 0,0029 – 0,0220 SEK in the first days, according to an online options calculator. This could possibly create some good trading opportunities in the option (warrant) during the upcoming year, if the management delivers according to their own forecast. Options are always risky though as you can loose 100% of your stake in case it ends up out-of-the-money by the time it expires. The DCF above is rather conservative and we believe TrustBuddy is a good trade at these levels and at this time with our conservative forecast. If you believe more on the CEO and his forecast of reaching breakeven during 2016, whereas we believe they reach breakeven in 2017, then this is even a better buy. Whether you choose to be part of the share issue or not is more up to you and your risk preferences. We are considering to invest right after the share issue. Disclosure: I currently do not own any TrustBuddy shares. I wrote this article myself, and it expresses my own opinions. I am not receiving compensation for it. I have no business relationship with any company whose stock is mentioned in this article. This article should not be regarded as a buy or sell recommendation or investment advice in any way.